aPUB is a modern company in the digital age. We are not dependent on the physical space, but we consists of a loose network of specialists in different parts of the world. The constellations therefore varies in time and with the assignment. This gives us a lot of flexibility because we do not have large fixed costs of premises, investments and staff. We rather adapt to the missions or our own projects we have at the moment. The basis of our work is our love for nature in general and the sea in particular, which is reflected clearly in our own publishing but also in our external assignments – translations, illustrations, articles, production of member magazines, etc. aPUB primarily focuses on publishing our own books, where water and education is often a common denominator. But we also have many clients who want help with everything from simple illustrations to translations or major book production. If you have an idea we can help you realize it! As you probably understand by our own publications, we have great expertise in vector based illustration. Adobe Illustrator is our tool for everything from making technical documentation a bit more realistic to illustrate the amazing coral reef diversity. We are convinced that a good illustration often gives a better image than a photo for the viewer. Whether it is a simple flyers, magazine or a comprehensive photo book, we will help you put the pieces together into a neat layout. The results can then be distributed electronically in different formats or through traditional paper prints. We have extensive experience in translating technical texts from English into Swedish, especially when it comes to general science and in particular the areas that have to do with water. We do not use machine translation, we do it from scratch. It will always be better so. It is becoming easier to publish your own books, especially if you opt out the traditional printed book. However, there are a lot of challenges if you want to use distribution channels such as Amazon's Kindle or iBooks Store, for example, the US tax authorities. We can help you through those tricky steps. With today's technology it is only your imagination that sets the limits and not the big publishers censors. If you have an idea, it is possible make real. Please contact us so we can help you realize your dream. I have always had a great interest to express myself visually – drawing, painting, photography – but it was when I discovered Adobe Illustrator in 1990 as it really started. As is so often is the case, it was chance that brought this tool to me. I was involved in a large translation project and there was a need to adjust a few illustrations. I soon realized that work with illustrations was much more fun than translations (but translations from English to Swedish is still a part of my business). The journey to date has been quite winding. 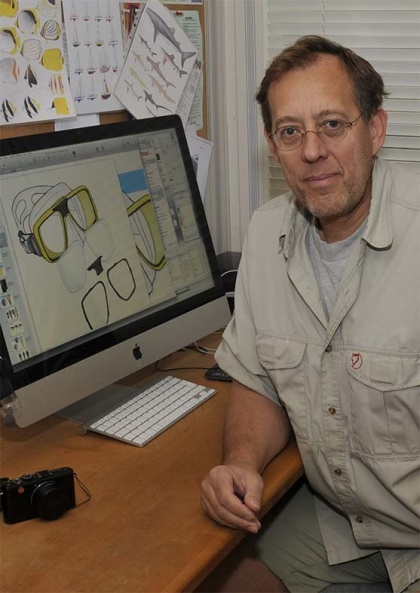 I worked for many years with dive education, both in Sweden and in tropical areas. Then there was 15 years in the public school system, first as teacher in biology, chemistry, and natural history, and the last 8 years as headmaster. A road traffic accident gave me time to think, which resulted in the decision to end my career as school leader. Since autumn 2014, I’m working full-time with creative activities – illustrations, articles, translations and my own book projects. My hobbies and my education is also my specialist areas, which can be summed up in "everything associated with water" – diving, sailing, kayaking, fishing, marine biology, oceanography. My general knowledge in technology and science has also given me a lot of assignments to transform technical drawings to something more vivid and comprehensible. If you like what you see here on our home page (a small selection of what we have done) and need help with illustrations, you should not hesitate to contact us for a discussion on future cooperation.